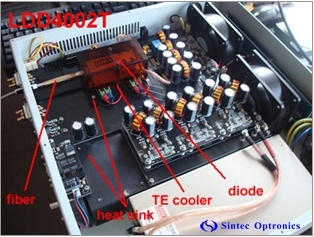 In a diode pumped Nd:YAG laser marker, a diode driver, a Q-switch driver and a DC power supply are needed. 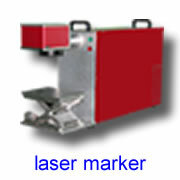 They are individual with large size and then the size of the laser marker is also large. 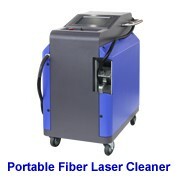 It is not convenient to move the laser marker due to large size. 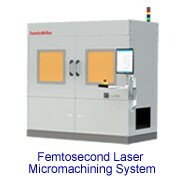 We have developed a “3 in 1” laser power supply and the above power supplies are integrated into one unit with compact size. Compact in size and light in weight. If “3 in 1” laser power is used in a laser marker, the marker will be simple and it consists a laser head with a marking head and a power supply as shown as follows. The marker will be portable. 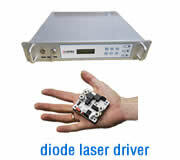 The laser diode driver LDD is a high current-constant laser diode driver with a thermo-electric cooler controller. Current control, transient suppression, over-temperature protection, short circuit protection, and over current limit are provided. A temperature sensor is used to measure the temperature of the laser diode and then the constant-temperature is kept by automatically adjusting the current of the thermo-electric cooler. AA - maximum output current (A). Max is 60A and it is continuously adjustable. VV - maximum output voltage (V). Max is 60V and it is continuously adjustable. T - with a thermal electronic cooler & power supply. maximum 3 output channels. x - number of TE coolers. · Max. 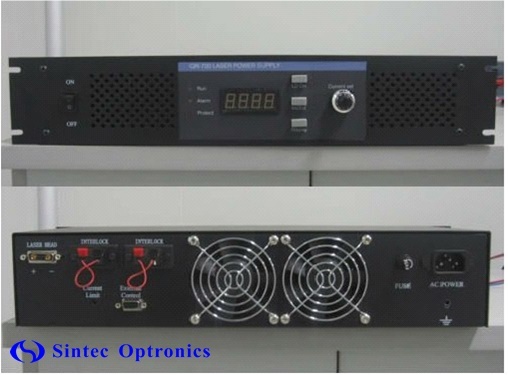 3 channels of TE cooler, one is used to cool diode laser, another 2 channels may be used for cooling laser medium and Q-switch. The output is max. 12V 10A. 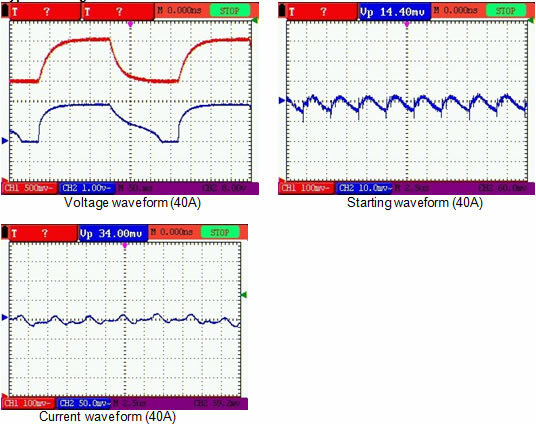 · One channel output to drive diode laser. The output is max. 2V 40A. Others available upon request. · The output current to diode laser can be adjusted by internal or external signal. LDD-4002T: output 40A 2V and with one channel TE cooler for cooling diode laser. LDD-4002T2: output 40A 2V and with 2 channels TE coolers for cooling diode laser and laser medium. 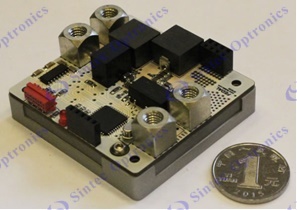 LDD-4002T3: output 40A 2V and with 3 channels TE coolers for cooling diode laser, laser medium and SHG crystal. LDD2 is a series of laser diode drivers intended for single laser diode driving as well as for laser diode arrays driving. Maximal output power ranges from 50W to 1500W, and maximal output current ranges from 5A to100A. These drivers may be used for industrial and medical applications. The maximum output voltage is maximum output power divided by output current. 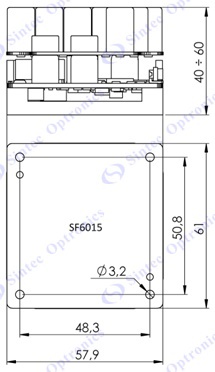 * Additional information about LDD-50 model is available on request. Maximal output voltage in these examples is 2.1V and 30V, respectively. Apply +5V DC on this pin to enable work of LDD. While 0V are applied to this pin or pin is unconnected module is disabled. Once Fault has occurred module is blocked till you eliminate fault cause, then disable module and enable it again. If module is enabled and some trouble has occurred, module automatically stops operations and sets Fault status (Fault loop is “closed”). In case of normal operations Fault loop is “opened”. Maximal allowed current in Fault loop is 50mA. When Interlock loop is “opened” output is inhibited. You should “close” this loop to start operations (electrical resistance of “closed” loop should be below 100 Ohm level). Once Interlock has occurred module is blocked till you “close” Interlock loop, then disable module and enable it again. Return of all interface circuits. This pin is connected to the GROUND stud. The voltage at this pin is a monitor signal proportional to the measured value of voltage on load. 0V at PIN5 corresponds to 0V at load. Voltage at PIN5 corresponds either to voltage at load (VMAX < 10V) or to one-half of this voltage (VMAX > 10V). The voltage at this pin is a monitor signal proportional to the measured value of output current. 0V at PIN6 corresponds to 0A. 10V at PIN6 corresponds to IMAX. Voltage applied to this pin sets output current. 0-10V DC are linear with 0-IMAX. 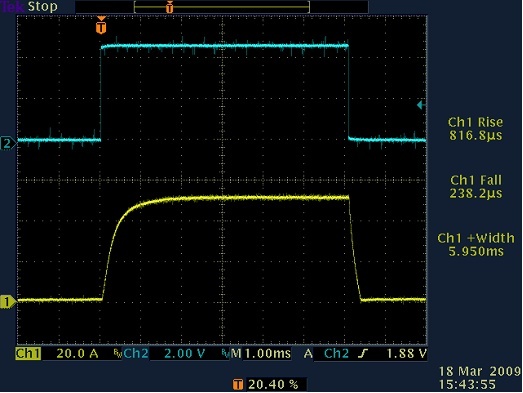 Apply +5V DC on this pin to allow the output. While 0V are applied to this pin or pin is unconnected output is inhibited. Auxiliary 15 VDC output. Maximal current – 100mA. · overheating (temperature of the module exceeds 70+/–2 °C level). To remove Fault status module must be cooled below 65+/–1 °C temperature. · overvoltage (voltage on the load exceeds 110% of VMAX level). Most popular causes of such fault are load type mismatch and load absence. Once Fault has occurred you should eliminate Fault cause, then “reboot” module (DISABLE module and ENABLE it again). 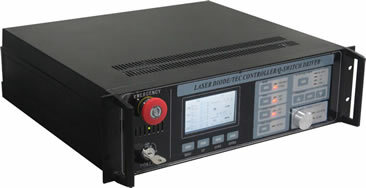 LDD2-2U laser diode controller consists of LDD2-series laser diode driver, none/one/two temperature controllers, user interface and 19-inch rack mounted coverage case. Yellow curve depicts some arbitrary output current pulse. Timescale is 1 ms/div. 1. 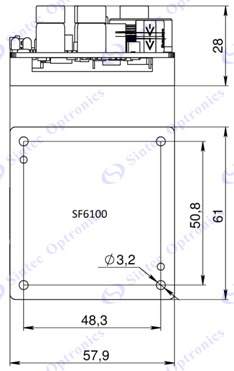 Diode driver: Maximal output current (IMAX) is selected by the customer in range 10-100A. Module’s output current can never exceed this IMAX value. 2. Diode driver: Compliance voltage (VMAX) is selected by the customer in range 2-150V. Module’s output voltage can never exceed VMAX value. 5. TEC driver: Standardly our TEC controllers are designed to get feedback from 10kOhm NTC thermistors. Diode driver is designed to supplying the laser diodes and diode arrays by pulsed current up to 200A or DC current up to 64A. 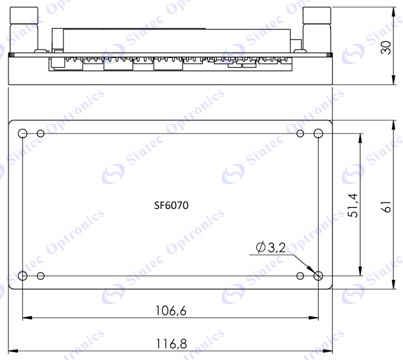 Produced as an OEM module. The driver provides a wide range of smooth change of parameters of radiation. 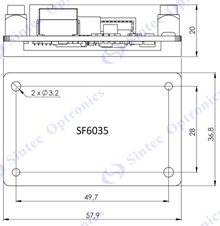 Series SSF60XX is widely used in laser technology complexes (marking, welding, soldering, cutting), medical devices, measuring laser equipment (spectrometers, lidar, range finders). 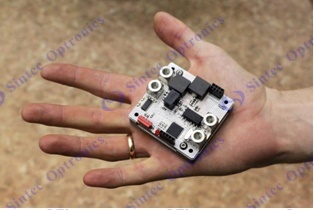 TEC module is designed for regulating the temperature of the objects and the stabilizing its temperature at the certain level. The target temperature is set with an analog input voltage. Voltage output is provided to monitor temperature of the object. 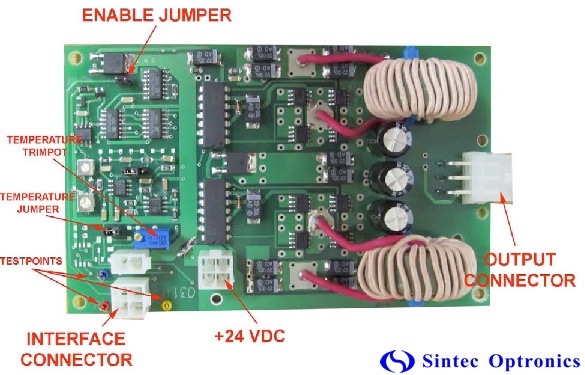 ST-GN720 series laser power supply, which is widely used to drive laser diode and laser diode array, is a high efficient power supply to allow you get stable current output for diode pumped solid state laser with AOM configuration. ST-GN720 series laser power supply is commonly used in the laser system for marking, welding, trimming, cutting, micro machining, precision drilling systems. 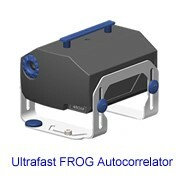 It can be controlled internally or externally, providing a good control synchronization for customer’s external devices. 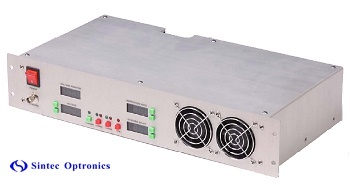 ST-GN720 series laser power supply has interlocks to protect the power supply and laser systems from over-temperature, low water flow, over voltage and over current.